Here is a yellow-eyed penguin enjoying the view. 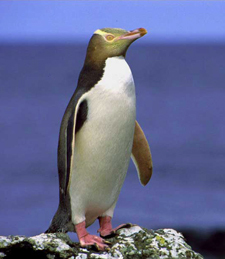 Today, I want to write about a really cool species of penguin, the yellow-eyed penguin. They are the fourth largest penguin, growing up to 68 cm tall. They feed almost exclusively on fish (with a few squid as well), swimming near the bottom of the ocean to catch blue cod, red cod, sprat and opalfish. They swim up to 25 km offshore to find food and are excellent divers. Unlike most penguins that breed in colonies, yellow-eyed penguins breed in forests, making their eggs near the bases of trees and rocks. They lay 2 eggs and both the female and male help to feed the chicks. Every year, at the end of the breeding season, adults moult their feathers. During this time, they are unable to swim. Some people think that the yellow-eyed penguin is the rarest penguin in the world. They live on the South Island of New Zealand and on a few nearby islands. There are perhaps about 4,000 left in the wild, with loss of habitat and introduced pests the biggest threats to their long-term survival. Are there any other interesting facts that you would like to share about yellow-eyed penguins?